Robert Bosch GmbH prevents rear-end collisions in the Audi A7 with its automatic emergency braking system that debuted on the A8, the German automaker's flagship sedan. The system detects objects ahead by using radar and a video camera. Analysis of the Bosch system's sensor data determines whether braking should be applied and, if so, how much. Should a collision be predicted, the brakes are readied for use and an alarm sounds. If the driver does not heed that warning, maximum braking occurs about half a second before the expected impact. Bosch's electronic stability control then helps bring the automobile to an orderly stop. 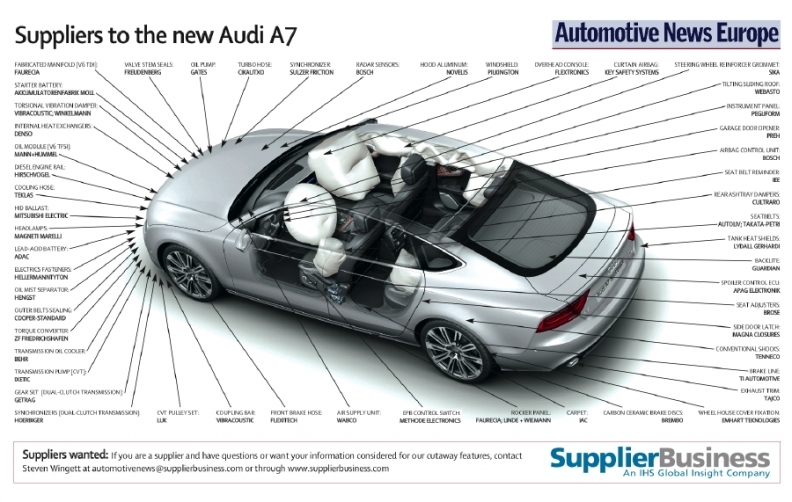 The A7 is the second liftback model from Audi. The car, which competes against the Mercedes-Benz CLS and Jaguar XF, comes with a choice of four V-6 engines -- two gasoline and two diesel -- all of which possess stop-start and brake regeneration systems. Customers may choose, depending on the engine, between two transmissions: a multitronic front-wheel drive or a sporty seven-speed all-wheel drive. The A7 shares much of its high-end technology with the A8. Audi assembles the A7 at its plant in Neckarsulm, Germany. Prices start at 48,900 euros in the German brand's home market.